as well as preserve them, is to make small items like bookmarks! The photo is on pg. 33 and the instructions on pg. 38. I used the center of the insertion only in this design. 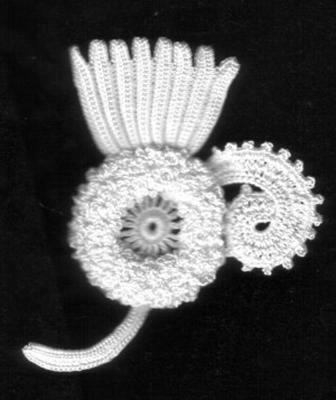 The outer rows are typical of Irish crochet. What did I learn from these instructions? 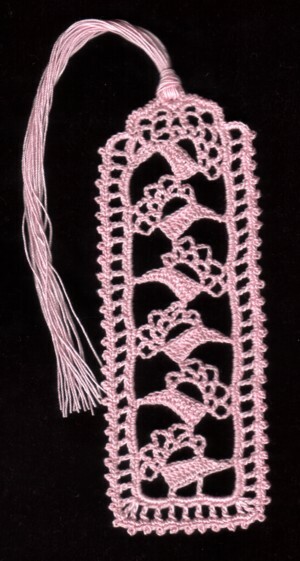 A 'single' is a slip stitch and a 'plain' is a single crochet. It also says '1 treble 1 1/2 long' which I believe to mean a double crochet that has an extra yarn over (although I could be mistaken). This was made in #40 thread. Once I understood the instructions, it was easy and quick! I'll add more as I complete them!